Sammie through the wild flowers, Garland Ranch. Anyone who’s visited Monterey County with a dog knows about that glorious off-leash beach in Carmel-by-the-Sea. But that's not the only place you can unclip Spot and Sassy and let them run free so long as they stay within sight and under voice control. 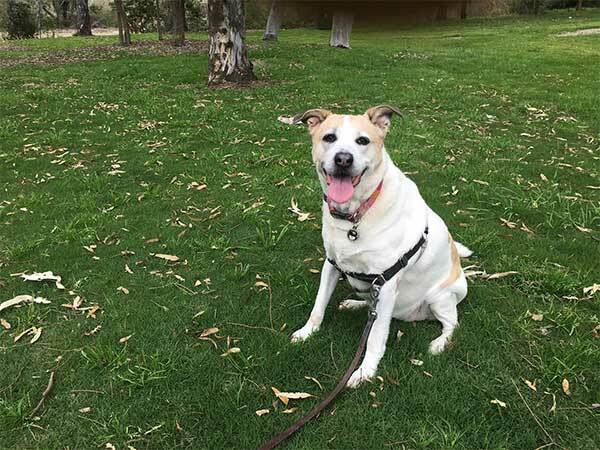 Garland Ranch Regional Park in Carmel Valley has miles of trails to roam, a river and tributary creek with swimming holes to splash in, a stellar visitor center and even specially designed water fountains for dogs. Zuke's encourages you to live life off leash! Without your dog, this would be exercise! Trails in the 4,462-acre park range from the flat and easy 1.4-mile Lupine Loop skirting the Carmel River flood plain to the strenuous, 1,600-foot climb to Snivley's Ridge via the scenic Sky Trail. For an easy hike with very little elevation gain, choose the Lupine Loop, the 1.5-mile Rancho Loop or the 1.8-mile Buckeye Nature Trail, where the experience is enriched with interpretive signs. For a more vigorous, 3.5-mile trek, try the out-and-back La Mesa Trail from the visitor center to Mesa Pond, a seasonal pool on an elevated plateau overlooking Carmel Valley. Plan the better part of a day for the seven-mile (one way) hike up to Snively’s Ridge, highest point in the park—and bring plenty of water for you and your dog to stay hydrated, as you’ll encounter 2,000 feet of elevation gain along the way and be dog tired when you get back.